Republicans have offered to hear from Kavanaugh's accuser in private or public. The overarching message from Republicans Wednesday to Christine Blasey Ford: Show up or we’re heading to a vote. “She said she wanted to appear but if she changes her mind and refuses to appear, there's not much we can do,” the number two Republican in the Senate, John Cornyn of Texas, said of the California professor who alleges Supreme Court nominee Brett Kavanaugh sexually assaulted her when they both were in high school. In a letter to Ford's lawyers on Wednesday, Senate Judiciary Chairman Charles Grassley repeated his invitation to Ford to be heard by senators, in public or in private. Grassley gave them until 10 a.m. Friday to respond if Ford is going to talk to the committee on Monday. Her lawyers said Tuesday Ford wanted the FBI to investigate her allegation before any talk of testifying, echoing what Senate Democrats have argued. Wednesday evening, Ford attorney Lisa Banks sent out another statement, saying "the Committee's stated plan to move forward with a hearing that has only two witnesses is not a fair or good faith investigation; there are multiple witnesses whose names have appeared publicly and should be included in any proceeding. The rush to a hearing is unnecessary, and contrary to the Committee discovering the truth." (J. Scott Applewhite/AP) Senate Foreign Relations Committee Chairman Sen. Bob Corker comments on Supreme Court nominee Brett Kavanaugh on Capitol Hill in Washington, Sept. 18, 2018. 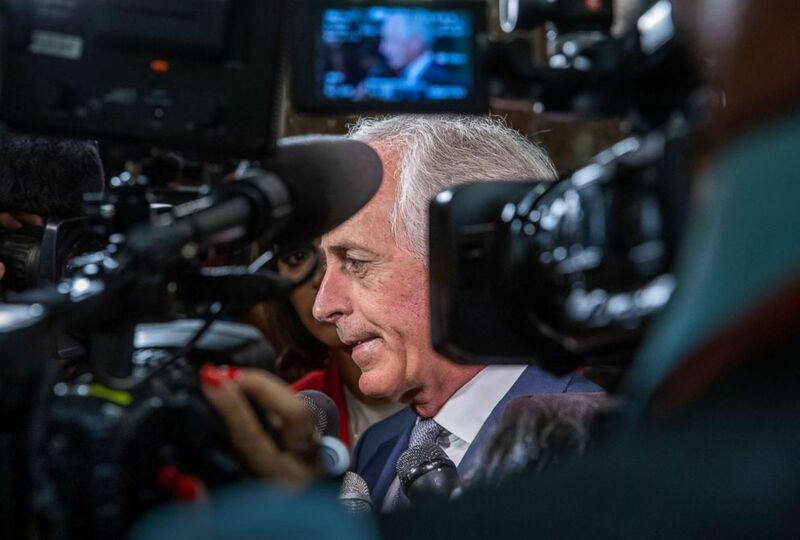 Tennessee Sen. Bob Corker, one of the first Republicans to call for Ford to testify, agrees with Cornyn on Monday as a deadline. “Republicans extended a hand in good faith. If we don’t hear from both sides on Monday, let’s vote,” Corker tweeted. The handful of Republicans most vocal about their reservations seem to be growing increasingly frustrated. (Win McNamee/Getty Images) Sen. Susan Collins answers questions from reporters on allegations against Supreme Court nominee Brett Kavanaugh on Capitol Hill, Sept. 17, 2018 in Washington. Sen. Susan Collins of Maine is urging Ford to reconsider and doesn’t think she can reject testifying in some form, either privately or publicly. 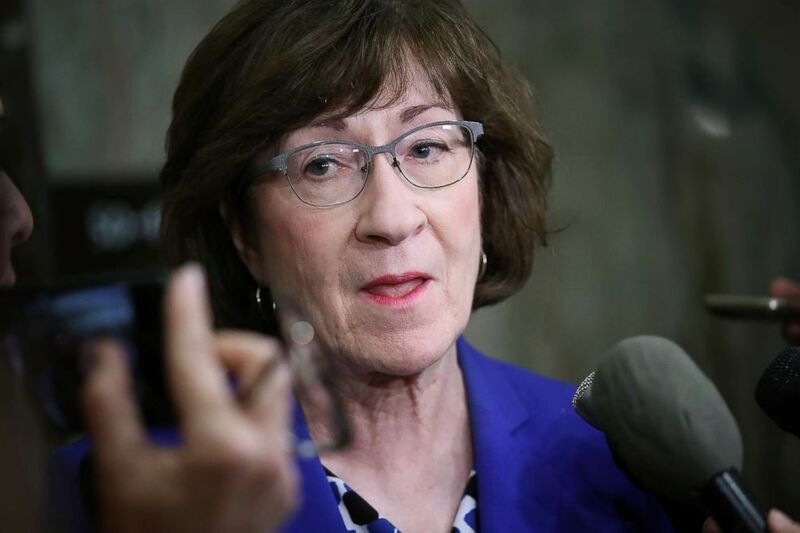 “Otherwise there are these very serious allegations hanging over the head of a nominee who has emphatically denied them and that's just not a good way for us to end,” Collins said in an interview with Maine radio station WVOM. (Pablo Martinez Monsivai/AP) Sen. Jeff Flake, a member of the Judiciary Committee, walks past members of the media as he heads to Senate Chamber floor on Capitol Hill in Washington, Sept. 18, 2018. 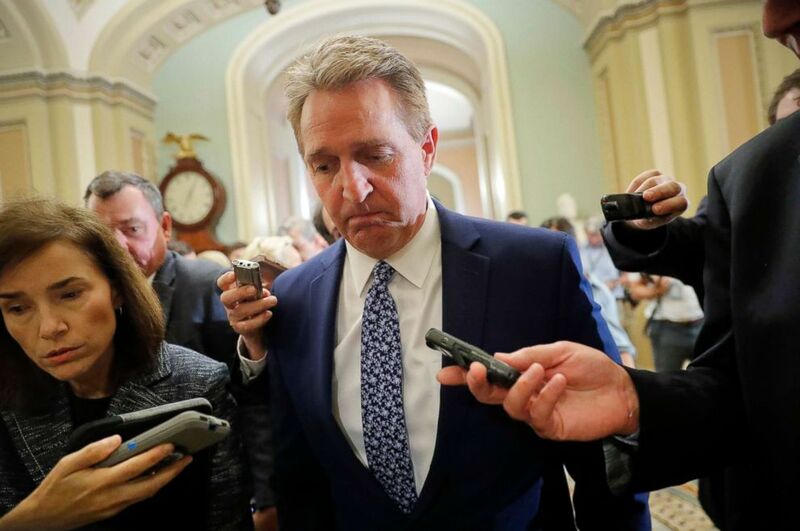 Sen. Jeff Flake of Arizona, another Republican who has said it is important for Ford to be heard, also tweeted his exhortation to her. Some Democrats reacted sharply to the Republican position. Sen. Kirsten Gillibrand of New York said: " I think saying you either testify on Monday or not be heard, I think is fairly outrageous." "There needs to be some element of an impartial investigation with that information going to the committee members before we have a public spectacle," Democratic Sen. Doug Jones of Alabama said. (Al Drago/Bloomberg via Getty Images) Senator Chuck Grassley, a Republican from Iowa and chairman of the Senate Judiciary Committee, walks through the U.S. Capitol in Washington, Sept. 18, 2018. 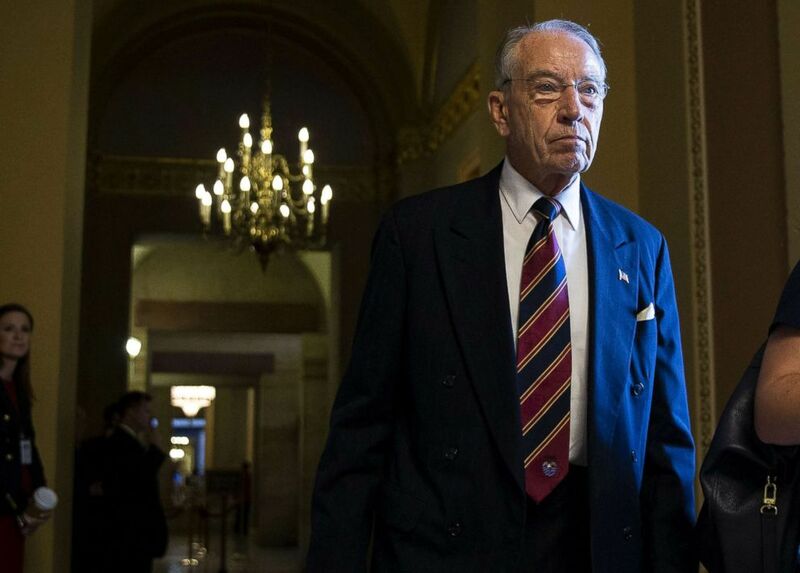 Late Wednesday afternoon, Grassley sent a new letter to Democrats on the Judiciary Committee, rejecting their request to delay Monday's hearing and dismissing calls for the FBI to investigate Ford's allegation. Grassley stressed that the committee has offered to hear from Ford in an open or closed hearing, or to have committee staff interview her in public or in private. “We’ve gone beyond what we did the first day of just having the open hearing she asked for. Because we've heard she may not want to come into that environment so we offered one more closed session or two ways of doing it by transcript,” he said. Asked if he finds the allegations credible, Grassley, exasperated, said “That’s why we’re having a hearing,” as the elevator door closed.